I recently joined SparkPeople . 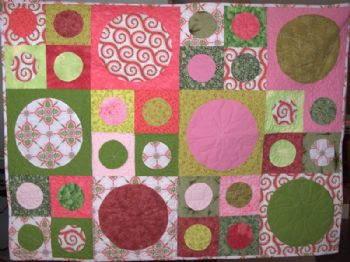 . . and while I was poking around the blogs, I found this quilt. The blogger received it as a gift from her quilter sister. (Follow the link to read about it on her blog). I was thinking that it’s a great example of how our winner(s) this month could add some 12″ circle blocks to create a much larger quilt from their blocks. This approach would also work with blocks from other months, for example, like last month’s Spools.